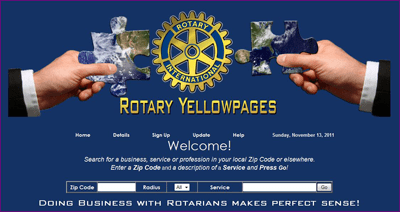 Project Description: Create a member directory for Rotary Club members. Visitors search for Rotary Club members from the home page. Search can be based on zip code and mile radius and/or keywords. Search results display member business data with a link to the member’s optional bonus page. Members with a bonus page are able to give site visitors details about their business including an image and printable coupon. Rotary Club members can purchase a directory listing and bonus page. Members can manage their directory listing, keywords that describe their service or business, change their password, upgrade from a basic to a bonus account and renew their listing. Site administrator can manage junior administrators, member data, member permissions and site email text.